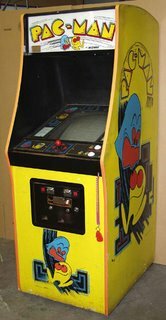 There was a time when you could go into an arcade with a dollar's worth of quarters and, if you were any good, play the game of your choice for an hour or more. Pac Man was my game. I would play and play at our local Kroger store (yes, there was a Pac Man machine at our Kroger) while my mom did the grocery shopping. In the mid-80's video game developers began rolling out games that were smash and shoot adventures with a multitude of immersive levels that you worked through while standing shoulder to shoulder with up to three guys and/or gals next to you. Really, the first such game of this ilk that I remember was Gauntlet. No matter how good you were at Gauntlet, you were going to get continually smoked by some ogre or ghost or something quarter after quarter, and then you were going to have to meet your folks out in front of JC Penney's while some kid standing behind you and picking his nose was going to step up, put a quarter in, and take up where you left off. Gauntlet was advertised to arcade owners as having unlimited play depth, so I guess that meant that there was no real finish to the game, no matter how many quarters were dropped down the slots. It didn't matter. You would always talk about how far you got without ever knowing or caring whether there was an end result to all your efforts. By the 1990's, arcades had slowly begun disappearing from the American suburban landscape as an industry that had built itself on the quarters out of kids pockets had turned its attention back to our homes and the foundations laid by Pong, the Atari 2600, Colecovision, Intellivision, Odyssey 2 and the Commodore 64. As the arcades vanished, so too did the simplicity of figures like Donkey Kong, Frogger and Pac Man. As graphic capabilities improved by leaps and bounds, they were all hustled into the 21st century and given extreme makeovers, leaving their old images in the dust. Most games were built to be beaten and discarded rather than reveled in for their mindless blips and blurps. I remember the experience of the arcade as a special event that cannot be replicated on today's modern machines, even as game marketers try to tap into my nostalgia by offering me the classic games of my past on shiny discs. Standing in front of a six foot cabinet covered with stickers and throwing your shoulder into evading brightly colored villains at every turn isn't the same as sitting on your sofa in your sock feet.